What we have on show here is a sample of what we produce for our clients week in, week out. All of these images are from installations completed in the last year or so and you can see that the Sculleries motto "better never stops" has been well applied by the team. All of our projects begin in the same fashion, we start with an empty space and with detailed information from our clients considering their needs and aspirations to ensure the space works. This all whilst hopefully inspiring our clients to the possibilities of handmade furniture without design limitations. We create a room or indeed many rooms that are beautiful and practical. We want the very best for our clients, regardless of the project; Kitchen, Bedroom, Bathroom, Media room. This commitment is what drives our projects through to beautiful successful conclusions. Visit our showrooms in Edinburgh and Perth or take a factory tour and talk to our knowledge-able design professionals. Follow our Website, Facebook, Twitter and Instagram page for regular updates on our success and progress. 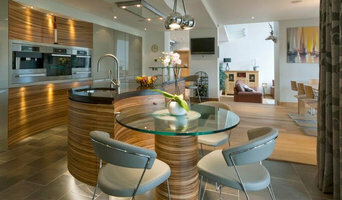 Kitchens International is one of the UK and Scotland's leading independent, luxury kitchen suppliers and retailers, with six showrooms across Scotland. Its award winning designs turn people's dreams into reality. Contact one of our showrooms to discuss your kitchen design. As the senior designer within the Ashley Ann Edinburgh and North Berwick showrooms, I have the great opportunity to express my passion for design and working with clients to create their dream space. Time is taken to enjoy a coffee and discuss the functionality and aesthetics desired to ensure that a truly unique space is created. 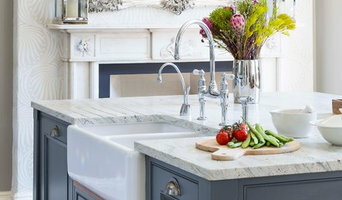 I work with Ashley Ann furniture; Siemens, Bosch, Neff, Britannia, Ilve and Faber appliances to name but a few; Blanco, Quooker and Michel Roux sink and accessories; Silestone, Sensa Granite, Quartz, Granite, Wood and Laminate work surfaces. All Ashley Ann furniture is made to order in Scotland for each project, thus resulting in a truly bespoke service and product. German Kitchens Edinburgh KBSA 2017 Award winning family run kitchen and bathroom company in Scotland with 3 kitchen & bathroom showrooms in Edinburgh, Glasgow & Livingston. Start of the art German kitchens and bathrooms from Pronorm, Hacker and more. Visit our website at <a rel="nofollow" target="_blank" href="http://www.ekco.co.uk">http://www.ekco.co.uk</a> or call today on 0131 343 6007. We will take you step-by-step through the process of your home building works and execute your vision with precision and professionalism. We take care of the stress so you can enjoy the process. A team of only the best, experienced tradesmen with full project management on site from start to finish ensure the utmost attention to detail. Our hands on approach provides a seamless service, and we pride ourselves on delivering the best finished product on time and within budget. From full property renovations and home improvement projects, to kitchens and bathrooms; we come prepared and equipped. Providing joinery, electrics, plumbing, plasterers, decorators & full project management from conception to completion. A unique bathroom design and installation company with a can do attitude, we are currently rated 4th out of 2500 bathroom fitting companies in the UK. Taking real pride in each and every project. For a complete list of our customer reviews please go to our web site at www.serenitybathrooms.com Our client reviews are a good reflection of the standards we work to. Looking for a new kitchen or bathroom? Why not let our design team assist? We have been helping customers across Scotland and North England for years building their ideal space to relax and create. Kevin will visit you in your home and discuss your options with you confirming your vision and ensuring your project is completed in good order. If you are considering a new kitchen or bathroom give us a call. Our design consultation is a free service and hopefully, you will engage our services to supply and install your project. As "Doctors" we also revive or reinvigorate tired kitchens with new doors, appliances or worktops etc. Vidaco is recognised as an architect of great products which consists of Haecker Kitchens and many other luxury brands, including Bora induction hobs. Where visionary design, quality, excellence and meticulous service lie at the heart of our business philosophy. We are not just a kitchen showroom but an expression of individuality and lifestyle. Reflecting the way that our customers want to live. Demanding the highest quality products & appliances we consistently provide the very best in service and care. Our typical customer spends between £10,000 and £60,000. Our showroom located within Fife has the potential to reach a large proportion of our target market, being situated within the commuter belt of Edinburgh which is only half an hour away. Luxury bathroom design and installation. Established 1984. At Splash we offer a large range of bathroom products. These products are the cutting edge of bathroom design and at prices, most can afford. Attention to detail and high standard of service are our keywords. Multi trade tradesmen who can plaster, plumb and tile, install doors and windows. Main work area is bathrooms though I do also work on other areas of property requiring any of the other trades. 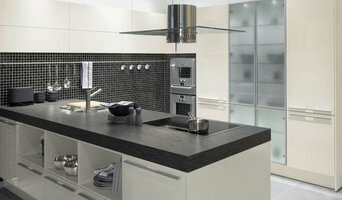 I do not install kitchens at the present however any tiling or plastering work in the kitchen I can carry out. David L Douglas is a family business that prides itself on producing the very best in hand-crafted luxury interiors including kitchens, bedrooms, bathrooms, studies, libraries, home offices, entertainment rooms, bars and bespoke fitted furniture commissions. David L Douglas has a team of highly skilled craftsmen and cabinet makers who hand-make all furniture onsite in our workshops. If you or your client's project demands the highest specification fitted furniture, David L Douglas can provide the solution. Established in 1990, we specialise in the design, manufacture and installation of uniquely tailored cabinetry for the home, whether bespoke kitchens, bathrooms, bedrooms, studies or wine cellars. We have the flair, ability and flexibility to customise and optimise individual spaces to suit lifestyles. We are the Edinburgh dealers for Everhot Electric Range Cookers with a working model at 21 Strathearn Road, Edinburgh, EH9 2AB. Telephone 0131 202 0177. 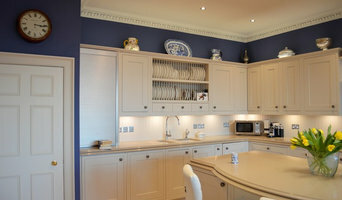 Countryside Kitchens & Interiors of Kelso have been providing bespoke, individually hand crafted kitchens for over 36 years throughout Scotland. Complimented by our own interior design specialists, our showroom collection includes lighting, fabrics, soft furnishings and a wide selection of natural stone and ceramic tiles. We are stockists of Farrow & Ball and the Little Greene Paint Company. Edinburgh Bathroom Designer. Bathroom and Kitchen Interior Designer. ¿Qué hace un experto en reformas de cocinas y baños de Heriot, Scottish Borders, UK? Es un tipo de contratista que se ha especializado en renovar la estructura de un espacio ya existente, en vez de en construir algo desde cero. Esto hace que reformar la cocina o reformar el baño sean trabajos algo más delicados, pues partir del trabajo que ha hecho otra persona anteriormente no te da la misma libertad que un folio en blanco. Este profesional traslada lo que hay en el plano arquitectónico a la realidad y, además, algunos expertos en reformas de cocinas y baños en Heriot, Scottish Borders, UK te podrán dar también asistencia en cuanto a temas de diseño. Tal y como haría un contratista general, este profesional es el responsable de subcontratar y supervisar a los demás expertos involucrados en el proyecto de tu cocina nueva o baño. También de proporcionar los materiales necesarios. Del mismo modo, deberá conocer aspectos legales que puedan ser condicionantes en la obra en Heriot, Scottish Borders, UK y las últimas tendencias. ¿Cómo puedes explicar tu proyecto a un diseñador de cocinas o a un diseñador de baños de Heriot, Scottish Borders, UK? En este caso las fotos también serán muy útiles para el diseñador de baños en Heriot, Scottish Borders, UK. Además, es importante tener en cuenta si el baño lo usarán principalmente adultos, niños o si será para toda la familia. Por ejemplo, si ya no tienes niños en casa, es posible que te merezca la pena cambiar la bañera por una ducha, pues entrar y salir de ella será mucho más sencillo. Y eso, con el paso de los años, lo agradecerás. En el diseño de baños también hay que pensar si se quiere ampliar la funcionalidad del mismo con algún otro aparato. ¿Quizá una bañera de hidromasaje? Decántate por un estilo de baño concreto: baños modernos, baños contemporáneos, baños clásicos, y ten en cuenta que diseño te gustaría y que materiales te gustaría emplear: qué tipo de suelos, azulejos, encimeras, lavabos, inodoros, mamparas.. quizás te gustaría incorporar piedra natural, gres o azulejo metro. Elige uno de entre todos nuestros diseñadores de baños y da con el baño perfecto para ti y tu familia. ¿Es realmente necesario un montador de cocinas y/o baños en Heriot, Scottish Borders, UK? 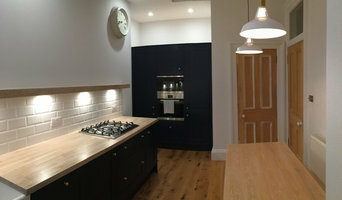 Encuentra expertos en reformas de cocinas y baños en Heriot, Scottish Borders, UK en Houzz. Mejora los resultados de la búsqueda en la sección “Profesionales” incluyendo el nombre de tu ciudad o comunidad autónoma. También puedes consultar las fotos de proyectos de los profesionales de Heriot, Scottish Borders, UK para encontrar expertos que hayan trabajado en proyectos similares al tuyo. Puedes solicitar presupuesto directamente al hacer clic en uno de los servicios que proporcionan las empresas de instalación y reformas de cocinas y baños de tu zona en la parte superior de esta página.